Toronto is a city with global status mostly known for its beautiful and recognizable skyline and high quality of life. It is home to the CN Tower, Lake Ontario and Ripley's Aquarium (to name a few), and now it is also becoming a major tech investment hub that draws the attention of many techpreneurs. Living in Toronto is an exciting experience in itself. 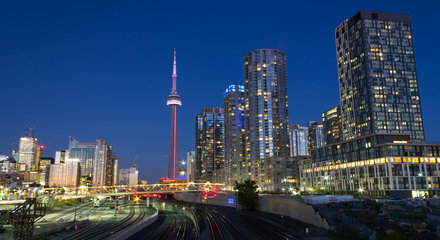 The skyscrapers, the city views, the parks and plenty of choices whether you are looking for entertainment or to evolve professionally, Toronto is the city to be in. With high, mid and low-rise options, as well as astonishing detached homes, Toronto remains the favorite choice of many homebuyers. Toronto relies on the most convenient solutions to enable getting around within and outside the city. It is well-connected with the rest of the GTA through a network of railways, highways, GO transit and buses, and it also has numerous bicycle and hiking trails for those who rather walk or cycle. Canada's biggest city offers an exciting urban lifestyle with lots to see and lots to do. From world-class events and festivals to amazing amenities, Toronto may be the best choice in Canada for big city fans.